Groot Constantia in times gone by. I was too cursory in wrapping up my whizz through the history of Cape winegrape-planting with just a few sentences about the big changes happening to the vineyard in the last decades of the 19th century. They were important transitional times, as phylloxera did its damaging stuff while forces like the government’s model farm at Groot Constantia played a rather more positive role. So here are a few more notes and remarks. Remember that in the 1820s, groendruif (semillon) had been hugely predominant, with muscadel, pontac, steen (chenin) and a half-dozen others following far behind. Move forward nearly a hundred years, and we have some useful figures from the report of a government commission into the depression in the wine industry in the early 20th century (statistics-gathering was improving). Greengrape still predominated, although at just under 40% it had clearly lost a good deal of ground (literally). “Stein” (a frequently encountered spelling of Steen) had risen to 20%. But suddenly cinsaut (known as hermitage) had increased spectacularly and was challenging steen. In fact it was soon to overtake it and become the most widely planted variety until chenin triumphed again at the end of the 1960s. 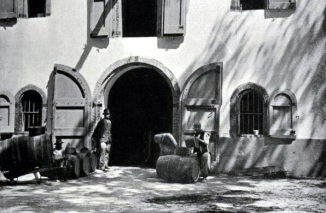 It’s widely reckoned that cinsaut arrived in the Cape around 1880, though some suggest a date as early as 1850 (for more about the story of cinsaut, see my Grape articles here and here). As for sauvignon blanc, the earliest mention of it that I have seen was in an 1887 “Report on the viticulture of the Colony” by one Charles Curry. He also speaks generally of the need to “test the lately imported varieties” to see “which varieties produce in the Cape climate the best wine”. It was indeed a time of experimentation. JP de Waal, who’d been manager at Groot Constantia, travelled to some of winelands of the world towards the end of the nineteenth century. He was generally impressed by Australia and recommended that the Department of Agriculture (which now exercised a monopoly on the importing of grape vines) should obtain material from there. As a result mataro (mourvèdre), malbec, and shiraz, were sourced in Australia. Shiraz is a tricky subject. Professor Orffer claimed that it had been in the Cape since early times, but I’ve never seen any evidence of this, and I don’t know what he based his claims on – I wonder if it was contemporary references to “Persian vines” (as discussed in comments to Joanne Gibson’s latest article), as he does seem to have accepted the myth that shiraz came from the Iranian city of that name. Anyway, as JP de Waal deemed it was necessary to import it, we can assume it wasn’t known to be around at the time. De Waal specifically recommended shiraz as a superior grape to popular cinsaut. Incidentally, it was de Waal who, while travelling in Bordeaux, first noticed the remarkable similarity between sémillon and the greengrape he knew so well from the Cape. The early death of de Waal shortly thereafter was surely a great loss to Cape viticulture. Fortunately the young IA Perold was already setting out to start making his important contribution. He was despatched abroad by the Cape government, charged with widening the range of grapes available in the Cape. The 177 varieties he returned with formed the core of the collection at the Welgevallen Experimental Farm of the University of Stellenbosch. Some of these varieties – including the port grapes and pinot noir – were planted out with some success at the time. So cinsaut flourished during the age of KWV rule during the larger part of the century. Palomino became increasingly important for “sherry” production, and its hectarage was second only to chenin blanc’s by the late 1970s. Of the top 15 varieties then, only three were red: cinsaut (plummeting but still about 14% of the vineyard), pinotage and cabernet – both of the latter still under 3%. The fightback against the deadening hand of the KWV and its concern for quantity rather than quality was getting underway, and it included planting more of the higher quality grapes (encouraged by the 1973 Wine of Origin legislation which meant that labels had to start telling the truth about the varieties they indicated). The rise of chardonnay in the 80s followed the farcical and notorious importing, by a bunch of producers desperate for clean, unvirused material, of what turned out to be auxerrois … Things started settling down to the basic pattern of plantings that we have now, with chenin drastically reduced (but still well in the lead) and shiraz and merlot joining cab and pinotage to clamber up the ladder. And all sorts of interesting varieties, both red and white, now at the lower rungs, as I described recently. Next articleWin a mixed case of Pinot Noir! Thanks Tim and Joanne for the great articles. Grape varieties aside, my understanding is that the style of wine made up until the start of the 20th century in South Africa was largely off-dry/sweet/fortified. When did the move toward dry table wines commence and what drove that change? Hi Tim, cabernet sauvignon was planted in Australia in 1817 from cuttings that came from the Cape. the person responsible for this was Gregory Blaxland owner of Australia’s first commercial winery. in 1822 his wines won medals in England. So Cape cabernet might be much older than we think. Thanks for the info re cab, Hennie. Are we sure that it was actually cab from the Cape?